Ivy is a huge Frozen fan, so of course there was no other choice than to throw her a Frozen themed third birthday party! I booked the party at a gymnastics venue, so the kids had an hour to run, jump and climb all over the place before coming into the party room for lunch. I didn't have a lot of time to set up the party room so it had to be very simple, but I also wanted it to look special for Ivy, so I focused on the tables and a few hanging decorations. We had so much fun with the party food, trying to think up things that would go with the Frozen theme. We sat and watched the movie together and wrote down any ideas that we had from it, then made little food signs to go on the table. I love party bags, it's such a fun opportunity to give all of the kids' friends some really cute stuff that we love! Because I wanted to stuff these bags full of fun we used some larger plain white bags and decorated them ourselves with snowflake stamps and Frozen gift tags. 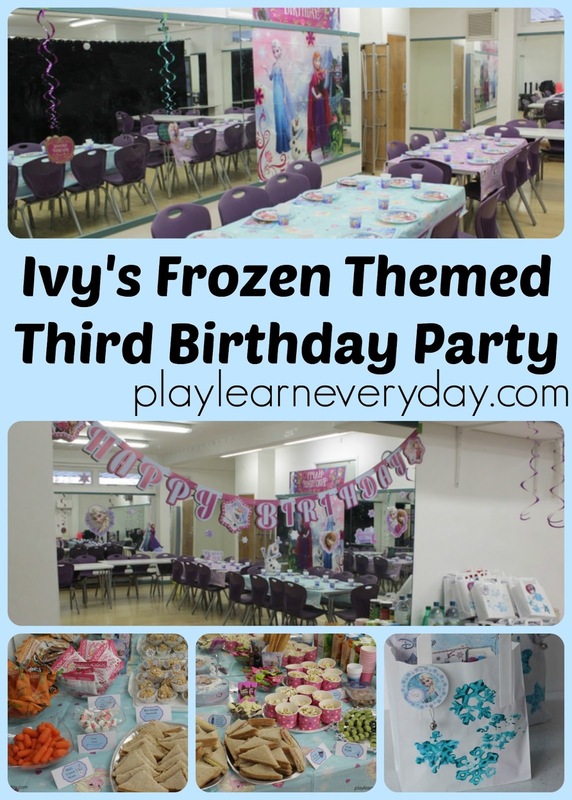 Of course Ivy also received a lot of Frozen themed gifts, check out our Frozen Inspired Gift List for ideas for your own little Frozen fan!